If you can’t get to Greece for the Olympics this summer you can at least eat like a Greek champion. Opa! wins by a landslide with its big bright room where the ceiling is one huge slanting skylight. Under a reedy awning by a babbling fountain, two tiny tables nestle in the far corner. There you can sit in intimacy and watch everyone else eat. 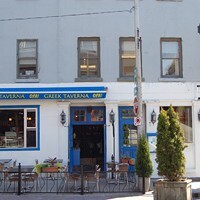 Some share piles of mezethes (starters) of everything from feta to dolmades to spanakopita, and some chow down on platters of lamb, chicken, or pork, all sided by delicious roast potatoes and salad, all ferried to your table by pleasant and attentive wait staff.